The candlestick chart is by far amongst the most commonly used tools of technical analysis in the forex market. The candlesticks are essentially the short to medium-term measure of price action and give important and interesting insight into swings in the forex market and gauging both the direction and the strength of the trend that might be underway. In simpler terms, the candlestick charts can also be considered as the visual representation of the emotions surrounding the price action of a specific entity that is being traded and its potential impact on the final pricing. The price action can be represented in multiple patterns within the basic candlestick format, but how do you determine what useful data is and how to glean through additional information that you could pass. For that first and foremost, there is need to understand what exactly the candlestick chart is and how to optimize its functionality. Though the Japanese have been using the candlestick pattern for over 2 centuries now, Steve Nison is credited with introducing it to the western world in its present form. Historical data indicates that a Japanese rice trader Homma Munehisa developed this charting pattern to analyze the price action in rice contracts. The current form was developed sometime in the 19th century after series of development and evolution of the basic charting technique. The candlestick pattern indicates the price action over a specific time-period. It is a self sufficient unit that comprises the opening, closing as well as the high and lows that might be recorded during a specific time period. The key component of a candlestick is the body or a rectangular box like structure whose length is determined by the opening and the closing rate. The highs and lows that might have been achieved through the course of trading within that set period is denoted by the shadows or the vertical lines that are seen above or below the body. The color of the body also acts as a key indicator. When the body is empty and white in color, it represents a bullish session with the closing price significantly higher than the opening price. A bearish session is represented by the color black. If you have short horizontal lines in place of proper body, it is indicative of narrow rangebound trade where the closing price is at a similar level as that of the opening price. It is indicative of indecisive market mood. Though single candlesticks are packed with information on the ongoing swings in the forex market, a collection of these candlesticks will enable you to identify and confirm a trend in the market. One of the biggest advantages of using the candlestick pattern is they allow a sneak peek into the short-term movement in price action and gives you fair view of the current market trend. It is for this reason that most trading platforms provide access to these chart trends with simply the click of a mouse. The varying length of the body of a candlestick coupled with the color of the body is finally what decides on specific type of a candlestick. There are several sets if interpretation that one can derive through the basic visual representation that is achieved by plotting the opening, closing and intra-day highs and low rates. The length of the candlestick’s body is generally an indicator of the price action. It could be long or short depending on the entire swing in prices during the chosen time period. The other peculiar or rather a unique formation is the really short candlestick or almost absent body with a Spinning Top. This is created when the closing price and opening rates are at the same level and is an indicator of indecision in the market place. This is known as the Doji formation. If you ever have a four Doji, that is when the opening, closing, high and low all are denoted by the same value, it means trade was halted during that period, or there is a technical glitch. The Marubozu is another interesting phenomenon. It is a situation when you have fairly long bodies that could be either black or white but without the upper or lower shadows or both in some cases. The lack of shadow indicates a strong trend in the forex market. White represents that buyers are in control while black stands for control by sellers. Most times you will notice that these candlestick patterns would follow a specific symmetry in their formation. The bullish and bearish patterns within the same parameters would have a similar pattern structure, but varying colors and locations at certain points thereby highlighting the variation is the price action in the specific time period. Come to think of it there are close to 80 known candlestick chart patterns. But, are they all effective and do you need to track all of these to effectively track the market and place your strategies? Well, we have identified 5 key chart patterns that almost encompass the crux of the candlesticks and could be your sure fix to a profitable trading experience. This perhaps is one of the most uniquely positioned chart pattern where one is a mirror image of the other and convey contrasting information and chart patterns. The Piercing Line pattern comprises of black, rather long candlesticks followed by white long ones that closes almost halfway above the first one. It generally implies a bullish trend and the upmove the following day is a result of the short covering after the downtrend on day one. The Dark Cloud Cover is the exact opposite where a white long candlestick is followed by a black one. It implies bearish trends in the marketplace and is indicative of a downtrend in the market. Now we shift from generics to specifics. The first one on our radar is also something we touched a bit earlier. We strive to understand the dynamics of the Piercing Pattern of candlestick formation and what makes it such a sure fit in the forex market scenario, given all the insecurities and associated risks of trading such a volatile and liquid market that is functional almost non-stop through the week. Essentially this trading signal shows a two-day trading action with the first one clocking a decent range followed by a gap down opening but a close way above the closing price of the previous day. This does indicate an improvement in sentiment with a hope of a further upswing in the markets. More often than not this is a signal for wrapping up small or medium term downmove in the market. The benefit of a ‘piercing pattern’ as bullish signals works two ways. You can get a signal about the right time to buy as well as get hints about covering your shorts beyond a certain price point. However, it would be wrong to consider this as a self-sufficient single indicator weapon. You need to use it in tandem with other effective bearish/bullish signal indicators in the forex market. Next in the list of specifics is a clear understanding of the mirror image of the previous pattern, the Dark Cloud Cover. If piercing pattern is the other name for the bullish indicator, cloud cover stands for the bearish signs in the market. As expected visually, this looks the exact opposite of the piercing pattern. The black candlestick is preceded by a long white one. The name is quite appropriate. This chart works towards forming clouds of negative market sentiment on the face of positive trend. Essentially what it does is to signal the end of a bullish trend and signal the forex traders to prepare for some downtrend and bearish times ahead in days to come. The closing price of the dark cloud is seen hovering within the price range for the previous session of trade. However, it is invariably below the midpoint of the closing and opening rates that was seen that day. This is how it becomes such a sure indicator of downward move in the market with the bias shifting from bullish to bearish sentiment in the forex market. This pattern features among one of the topmost candlestick patterns used in the marketplace. It can be bullish or bearish engulfing. A Bullish Engulfing Pattern comprises of short black body candlestick followed by a comparatively longer white one which ends higher and had opened lower than the previous day’s trading action which is represented by the short black body. This, thus, indicates bullish formation in the market. The Bearish Engulfing Pattern signals the exact opposite where day one is represented by a short white body while the following box is a longer black one denoting continuation of the downtrend or bearish pattern in the forex market. As I had mentioned earlier, the Doji is nothing but an indicator of indecisive and rangebound trade in the market. 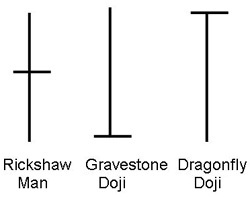 You different types of Doji that are formed, like tombstone (gravestone), dragonfly, rickshaw man. These are seen as signs of reversal in the marketplace. As the body is almost non-existent in case of Doji, it is the direction of the wick that determines the trend direction. The rising wick stands for a tombstone doji that denotes gradual reduction in bullish sentiment, therefore, prepare for a downtrend. The dragonfly pattern is just the opposite, signalling the market to prepare for an upmove. The next on our list is the Hammer and Shooting Star patterns. Though both are represented by short candles, it is the wick direction that seals the call on the market pattern for either of the two. In case of the hammer formation, you will notice that the wick is pointing down signaling the price action has reversed a selloff, and the upward trend has ensued. The shooting star is, therefore, the bearish one with the wick pointing up and signaling the end of bullish sentiment and alerting about prep work for the downward tide. The last but not the least effective of patterns, the Harami again is a ply of white and black candlesticks with special attention to the closing rate. The bullish Harami pattern shows a black long one closing near the intra-day lows immediately followed by short candlestick that is white in color. These indicate the halting or pause in selling pressure on day 2 with a hope of improvement in prices going forward. The bearish Harami is an exact opposite predicting further deterioration in prices. The candlestick patterns, we thus discussed, essentially establish direct connect between the emotional aspect surrounding the price action in the marketplace. The trader gets a clear view on the swings, direction and strength of the market trend with the help of this crucial swing indicator. It is almost a self-sufficient unit when interpreted in a right pattern with the potential of delivering significant long-term returns. The analysis of the swing allows the trader to befriend the trend in the forex market and work towards enhancing and consolidating strategies that have their inception in the difference in price action and swing movement. This is particularly effective in case of the forex market trade given all the misconceptions and assumptions surrounding the forex market. Once the specific time period is narrowed down and the concerned charts are isolated, this almost becomes the infallible tool to identify price action in the marketplace. The popular trading patterns are usually very easy to spot and can soon translate into effective forecasting tool for predicting future price moves simply on the basis of the select chart patterns. However, it must be recognized that accuracy of these chart patterns are intrinsically associated with the identification if right time periods. However, a forex trader should never lose sight of the basic factor that effectiveness of a strategy and overall success rate is directly proportional to the experience and awareness of the individual forex trader who is executing a specific strategy. In this perspective, these candlestick patterns become the enabler facilitating firm trades on the back of strong price action and confirmed trend signals. They truly unravel the myth and uncertainty associated with forex market trades and instills them with significant self-confidence to go ahead and execute a trade of their choice with aplomb. After all, they are in circulation for over 3 centuries now and the level of accuracy and precision, they have achieved through years of evolution and improvisation is hard to compete with. Yes, indeed candlestick patterns have stood the test if time and are all one needs to determine the relationship between buyers and sellers. I would like to introduce a simple concept that I use to help me interpret candlesticks. What I do sometimes is imagine what a candlestick would look like if I combined two of them together, which would give you a two day candlestick. When things don’t look clear you can apply this technique to get rid of some noise. An example would be if you combined both candles from a strong piercing line/ dark cloud cover together you would then have a two day candle that looks like a shooting star or hammer. Very good tip. Some candlestick do need confirmation and yes it can make pattern stronger. This is not clear – I see the idea but the as the 2 candles forming the PL or DCC pattern must, by the markets nature, have a large variety of bodies and shadows – I do not see how a Shooting star or hammer would form (by the combination of the 2 candles)in every case? Or do you mean IF a Hammer or Shooting star is formed by the combination of the 2 candles, THEN it means something? Even so this constructed 2 day candle, as a shooting star or Hammer would need to be confirmed by a 3rd candle ?? ?, which now would be the confirmation candle – but as such it would struggle to be strong enough against a 2 day candle- so it would need to be a 2 day candle also. By the way – I read what you write and suggest – I have researched the other setups you’ve mentioned (are they Nial Fullers? )- and I can see their merits on the charts. So thanks for that – it adds a string so to speak. However to trade them needs more input – the rules – If you want to write the rules up I can add them to the manual – provided P agrees. The way I see it though is that to trade successfully it is paramount to learn – know – test and trade a system that in itself is a proven system complete. Only after being successful can one really add refinement or extras to enhance the system. In this regard – the DBB and MA50 additions were great for the longer term followers – but for those just starting, the new info piled up possibility but added to confusion and being somewhat less successful systems than the original strong patterns concept – introduced doubt because of more trading failures. It is very difficult to know what is best here – and I do not know that is for sure. Yes, I’m not saying that every two candles put together will form a shooting star but some piercing line/ dark clouds do, but not all as you already mentioned some would have odd wicks. I was just using it as an illustration to help explain the concept of putting two candles together which will give a different picture compared to the candles on there own. As I mentioned before this technique can filter out noise when things look choppy or unclear, particularly when you look at a two day high and low compared to just looking at highs and lows on two separate days next to each other. Hope that clarifies it a bit. As for the inside bar false break, yes nial fuller does teach a method of trading the fakey but from the material I have seen of his I wouldn’t recommend others to trade it the same way as him. His concept and understanding of why the setup works is good but there are ways to only trade strong fakey setups which are in line with the principals of LuckScout which Nial does not teach. Yes I can write an article for your perusal to go into detail of the setup and rules behind it to ensure only strong trades are taken. I was planning on making a video but perhaps a written article first would be best followed by a video as pictures paint a thousand words. I will email it to when I have finished it and he can forward it to you if he thinks it’s suitable for LuckScout. Sir, tell me about ” Unique Three River Bottom ” pattern . are you already make any page about this pattern ? i do like the article about day currency pairs because it is full of important keys. but there is no archive about past of the currency pair. for example if i want to know about eur/usd records from last year up to now i have too search all the article about this currency pair and it takes time. is it possible to have an archive for each currency pair from one year past to now and possible to add the new article to this archive for now on? Are you talking about this page? as far as i know , “unique Three River Bottom” use in stock Market and i didn’t see anywhere that use this pattern in market . it indicates that reading the KEY article for more than 3 times is essential. Some pairs it works fine, counting all pairs I would make a loss over the last 10 years with major pairs. On each pair I got around 10 to 50 trades per 10 year period per candle setup and some pairs did really well and some did very poorly as if there was no consistancy in the results. I suppose I could just trade the pairs that do well but the sample rate is just not high enough to consider its reliablity. I prefer at least 1000 trades Id be willing to go to 100 if the profit factor was high enough, and tested on multiple pairs consistantly. I am open to the possibility thats why I am testing, but so far less then impressive results, even larry connors old school 2 period RSI out preforms candle sticks easily. Maybe I am missing something, If a proven price action trader can convince me other wise I m willing to refine my test procudure. This system is visual. You cannot test it like that. Hi, I have a new insight after reading your beautiful articles. But I have a question, are those candlestick patterns can be applied to bitcoin chart? They can applied to any “liquid” markets.